Yushu (aka Jyekundo (སྐྱེ་རྒུ་མདོ་) in Tibetan) is an Autonomous Prefecture in the Qinghai Provence of China. 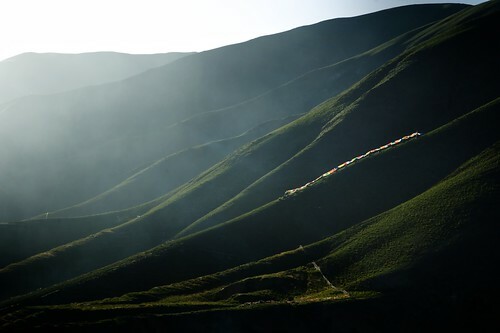 Located 800km south of the nearest city Xining, Yushu used to be a daunting 12-16 hour bus ride from Xining in the north or about 10 hours to Gantze in the south (where I came from). Now, it appears that Yushu has it’s own airport and has become quite a hot spot for tourists. I was only able to spend two days in Yushu due to visa restrictions, but it left a wonderful impression on me. I also did something a little different while I was there. I only spent one day site-seeing, and I spent the other in the market, shooting lots and lots of portraits. Click “Read the rest of this entry” to see some of my favorites. I was in Yushu just after a huge annual horse festival. This is an exciting time for Tibetans and they will often dress to impress. This woman is wearing some very expensive (and very heavy) jewelry in her hair. Nearby the town of Yushu is Jiana (Gyanak), the city of mani stones. Mani stones are slabs of rock carved and painted with holy scripture and symbols. Usually the stones are carved with the mantra “Om Mani Padme Hum”, a chant to recite during meditation that roughly translates into all the teachings of the Buddha. Tibet is covered with these stones that usually pile up nearby monasteries and important religious monuments. But the largest in the world can be found in Yushu. 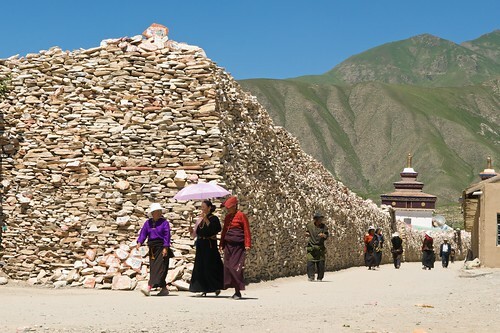 Tibetan Buddhists walk around the Jiana (Gyanak) Mani stone pile in Yushu, Tibet. A Tibetan Buddhists walks around the Jiana (Gyanak) Mani stone pile in Yushu, Tibet. 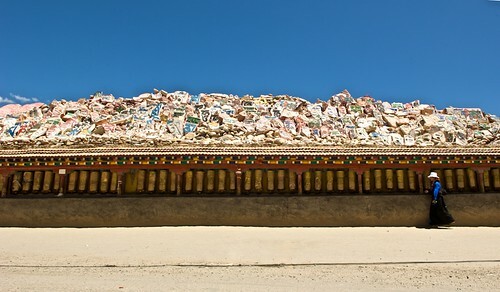 The mantra "Om Mani Padme Hum" is written in Tibetan on the top of the pile. It estimated that there are 2.5 billion stones in the 20,000 square meter pile, and it’s growing by about 300,000 every year. Apparently, it was originally built 1,700 years ago and later destroyed to be rebuilt in it’s present form. (I’m having trouble finding good information about it.) 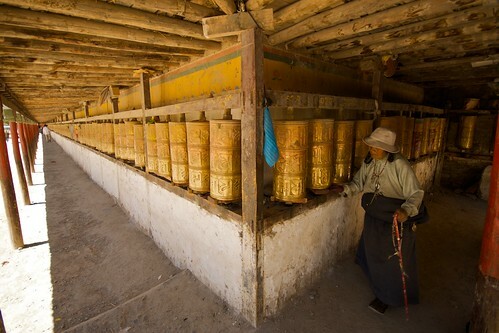 In and around it are a few temples and, as usual for Tibetan holy sites, lots of prayer wheels to spin. 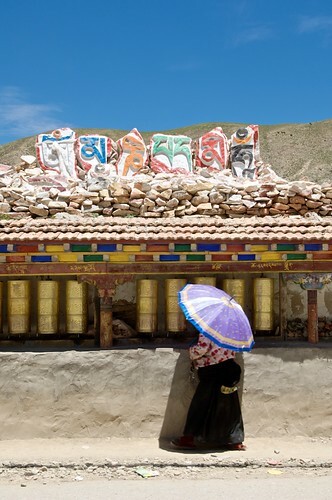 A Tibetan woman spins prayer wheels as she walks a kora around the giant mani stone pile in Yushu, Tibet. The Gyanak Mani Temple is the largest collection of carved prayer stones (mani stones) in Tibet. There are several billion prayer stones stacked 3 meters (10 feet) high in a 1 square kilometer area. On my second day, I visited the Jiegu Tibetan Buddhist monastery on the mountain just above Yushu. This isn’t the most famous in the area, that would be the Princess Wancheng Temple outside of town, but I didn’t have time to visit it. The Jiegu monastery doesn’t have a lot of sites, but it does have a nice row of chortens and a great view of Yushu and the surrounding mountains. 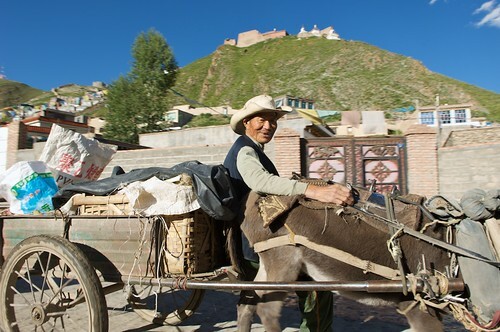 A happy smile from a Tibetan man as he drives a donkey cart towards the market in Yushu Tibet. The Jiegu Monastery can bee seen in the background. 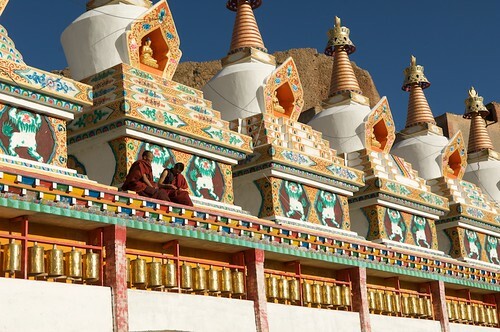 Monks relax on a large row of chortens at Jiegu Monastery in Yushu, Tibet. Tibetan Buddhist prayer flags blow in the wind on a mountain side near Yushu, Tibet. Yushu, like Zhongdian and Litang, is famous for a big horse riding festival held every summer. Unfortunately, I arrived just after the festival had finished, but there were still a lot of Tibetans dressed in their best clothes around, and this made for some good people watching. So, I spent the rest of my second day in Yushu doing nothing but trying to meet people and take their portraits. Now, I usually do take a lot of portraits of people when I travel, but I don’t often spend as much time doing it as I did on this day. I started out by finding a doorway with nice light and asking interesting-looking passer-bys if they would let me take their pictures. At first it was a bit difficult, but after an hour and a half or so, I found myself with quite a few nice ones. 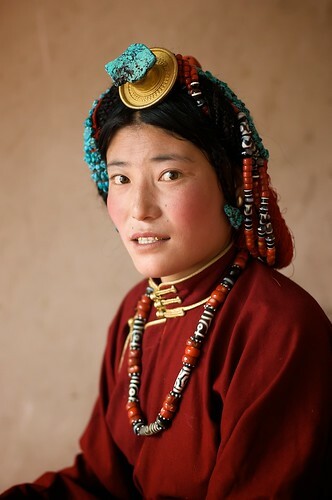 This woman is dressed in typical Kham-Tibetan jewelry. 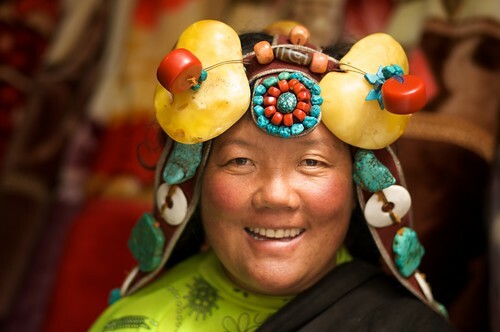 She's smiling strangely because she wants to make sure you can see her gold teeth...A definite fashion must-have in Tibet. 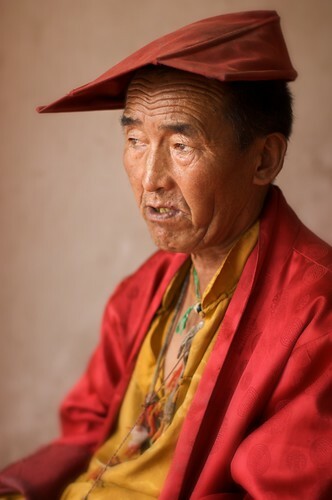 A Tibetan Monk contemplates as he has his portrait taken in Yushu, Tibet. 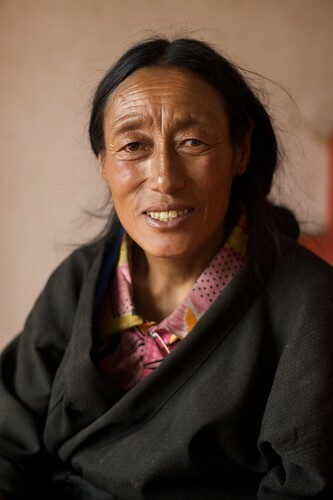 I took this woman's portrait just after the well-dressed woman and the senior monk's. I think she felt as if she wasn't worthy, but I convinced her to sit for me and she just beamed with excitement. It's nice to make someone feel special like that. 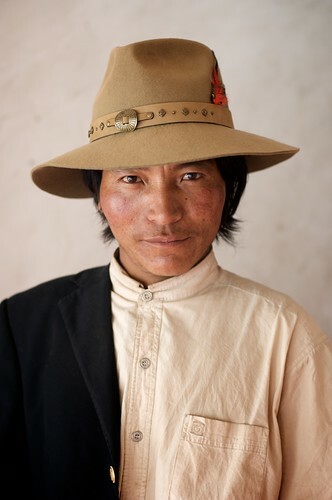 A Tibetan man wearing nice clothes poses for a photograph in Yushu, Tibet. You'll often seen Tibetans with only one arm through their coats. I think this is a bit fashionable, but it also serves to keep one warm without getting too hot. After that, I headed for the market area to take some more. Markets are always good places to people watch and photograph people. There you can get a combination of candid photos and portraits but the atmosphere can often be a little hectic, so there is a process that I follow… I’ll write a separate post on my techniques to do this in the next week, so check back! 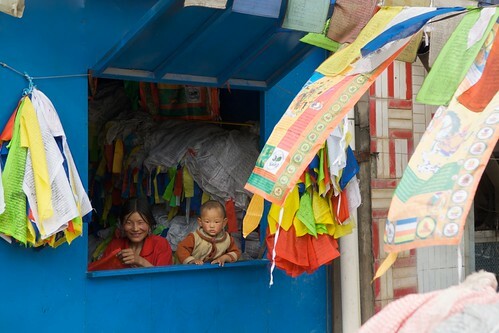 This woman and her child were selling Tibetan prayer flags at a stand in the market in Yushu, Tibet. 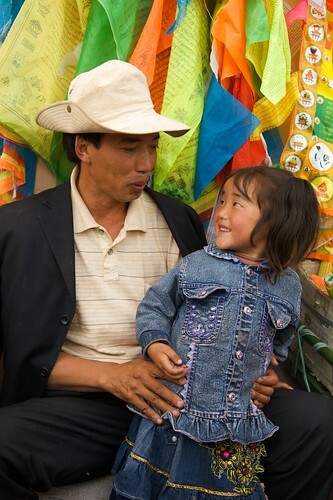 A Tibetan father and daughter react to having their picture taken in Yushu, Tibet. 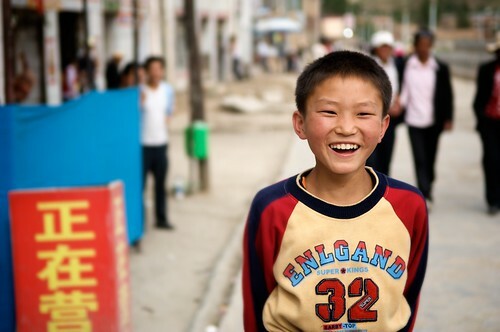 A young boy laughs as his picture is taken in Yushu, Tibet. 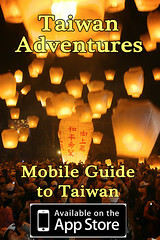 This is the sixth article on my travels to Tibet. The next will be about the amazing Jokhang Monastery and Barkor Square. The last was about Dege and its holy scripture printing press. The rest of the articles can be found here. Want to see even more photography from Tibet? Go to my Tibetan Gallery on my stock website. Wow what an amazingly untouched land. The sky is so blue! Thanks for the photos! Beautiful colors, excellent portraits! Wow, it’s interesting to see women there use umbrellas for the sun too. Those portraits have a real Steve McCurry type feel to them. Great work. Thanks man, that’s a nice compliment. I’m in the process of writing how I find them, but it’s turning into a beast of a post! Hopefully, I’ll finish it soon. Neil,as always you’re photos are beautiful. Brought back a lot of memories. Looking forward to seeing more of these! Thanks Alma! I’ll start to put up the posts from Lhasa soon! I hope all is well!!! nice photography:-) thanks for sharing. Neil, may I know the lens you’d used for the 4 portraits? The colors and clarity are astonishing. Absolutely amazing. Thank you very much Marlene. I’ll try to write more in the future! The four portraits in the middle were all shot with a 50mm f/1.4, set at f/1.8 or f/2. I did add a little extra blur using photoshop to the photo of the monk. I love the portraits you have taken at the “doorway”, you’re a true people-watching expert! That’s one hell of a journey . 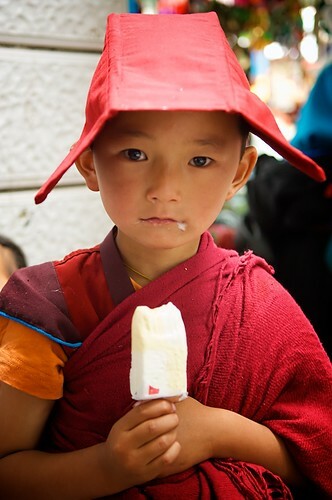 thanks for sharing beautiful portraits of Tibet and Tibetans.